Home /News/Could the 11XX Series Nvidia Cards Not Be As Great As We Think? Could the 11XX Series Nvidia Cards Not Be As Great As We Think? Sales in GPU’s have started to drop and the price has finally started to drop on new units but this comes for two reasons. Profit is way way down, the whole crypto market on a whole is way way down and until we see some recovery our profits will remain low. Secondly people waiting on the new 11 series cards instead of buying another 10 series cards. Details of the next gen Nvidia cards have been vague to say the least will no real leaks coming and no dates, although people are speculating that it may not be long until we see them. The image above taken from this Reddit post and thanks to microcompass for allowing us to use it gives us some idea of why the 11 series cards may not be as great for mining as we may think. 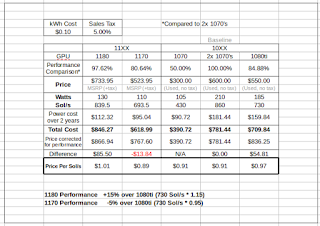 Assumed cost of $0.10/kWh, sales tax of 5% (no tax on used cards), and running cards 24/7 for two years. If the 1180 retails at $699, even with the efficiency increase, its actually pretty poor value compared to some of the deals that can be found on used 10XX cards right now. 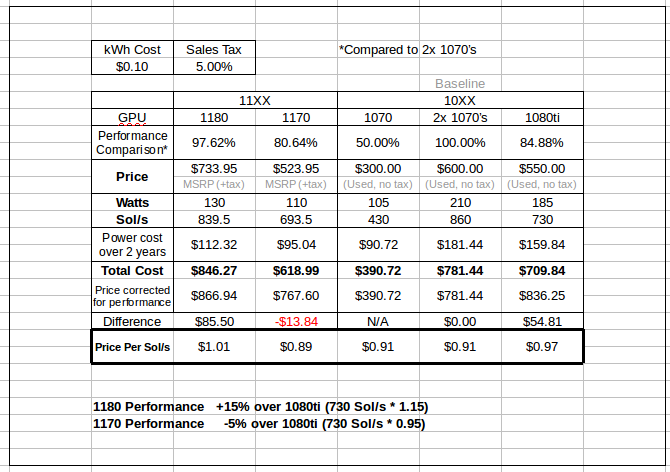 At $699, with a kWh cost of $0.10, I calculate a total cost price of $846.27 over 2 years, or $1.01 per Sol/s (assuming 840 Sol/s).The 1170 at $499 would be much better value, coming in at a 2 year total cost of $618.99, or $0.88 per Sol/s (assuming 703 Sol/s), but still not the game changer some might be expecting. 2x 1070’s at $300 each would produce a total cost of $781.44 over 2 years, or $0.91 per Sol/s (430 Sol/s X2), slightly worse than predicted on the 1170, however you can buy these TODAY, not 2-4 months down the road, more than making up for the slight overall cost bump.